Aimed at users such as construction workers and delivery staff, the tablet is the latest in Panasonic’s Toughpad lineup. It looks as sturdy as a brick and weighs about 430 grams. Aside from the 5-inch shatterproof touchscreen, the ruggedized casing houses a bar code scanner and an 8-megapixel rear camera. The FZ-E1 version runs Windows Embedded 8 Handheld on a Qualcomm 2.3GHz processor, while the FZ-X1 runs Android 4.2.2 on a Qualcomm 1.7GHz processor. 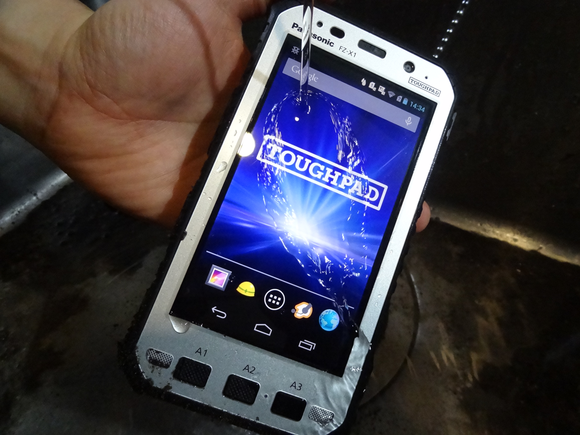 Panasonic’s new Toughpad 5-inch rugged tablet with phone functions gets all wet at its unveiling in Tokyo on Monday. They are the first tablets to have 3G and LTE in the Toughpad lineup, which includes seven additional tablets with screens ranging from 7 to 20 inches. The latest Toughpads can also be described as “phablets,” a recent category of tablets that have smartphone features. 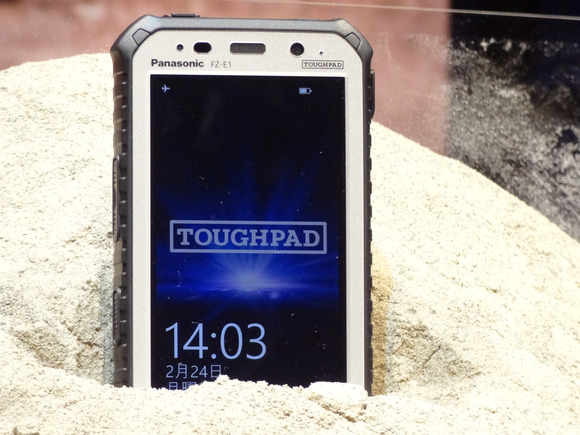 The 5-inch Toughpads will first go on sale in Japan for about ¥130,000 (US$1,268), Panasonic said. The FZ-E1 will launch in June, and the FZ-X1 will launch in August. The company also plans to launch it overseas, but it has not decided on a timeline yet. Panasonic emphasized that the Toughpad can be set up to suit user needs. “We decided to use Windows Embedded 8 Handheld instead of Windows Phone 8 because it offers more customizability,” Masaki Mutou, general manager at Panasonic System Networks’ Terminal Systems Business Unit, told a press conference in Tokyo. Apart from being dustproof and waterproof, the Toughpad can withstand being dropped onto a concrete floor from a height of 3 meters and being submerged in 1.5 meters of water for 30 minutes. Its screen won’t crack even if a 400 gram steel ball is dropped onto it. Its drop and shock resistance is rated to U.S. military MIL-STD-810G standards and it can operate in a temperature range of minus 20 to 60 Celsius, according to Panasonic. 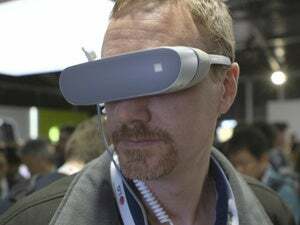 It also boasts a 100-decibel speaker system (about as loud as a motorcycle engine), 14-hour battery and the ability to swap batteries while the device stays on for a few minutes. Other features include Wi-Fi, Bluetooth, NFC (near field communication), USB 2.0, Micro USB and Micro SD. A version of the Toughpad that is a prototype for the European market is on display at Mobile World Congress 2014, which kicks off Monday in Barcelona, Spain, according to a spokesman for Panasonic. After posting losses at its mobile phone business, Panasonic withdrew from making smartphones for consumers last fall. It has focused on feature phones such as clamshell devices, which still command a following in Japan. For instance, Panasonic still produces its P-01F flip phone, which is sold through carrier NTT DoCoMo, as well as the 301P feature phone, sold through carrier SoftBank. The carriers are also selling the remainder of Panasonic’s consumer smartphone stock. Panasonic showed off its stylish, waterproof Eluga smartphones at Mobile World Congress 2012, but reviewers slammed its ungainly name, lack of onboard storage, and underwhelming camera. Rival NEC also announced its retreat from the smartphone market last year as Apple’s iPhone continued to grab market share in Japan.